[Sir Rickman Godlee, President of the Royal College of Surgeons and pioneer in the field of brain surgery.] Autograph Note Signed ('R. G. Godlee') to 'Mr. Rivington', regarding the 'ornamental' nature of his association with the Surgical Aid Society. On letterhead of Coombe End Farm, Whitchurch, Oxon. 22 June 1921. 1p, 12mo. In good condition, lightly aged, with thin strip of paper adhering to blank reverse. Reads: 'Dear Mr Rivington | I am sorry they dont give me any tickets for the Surgical Aid Socy. I am only ornamental | Yours truly | R. G. Godlee'. From the distinguished autograph collection of the psychiatrist Richard Alfred Hunter (1923-1981), whose collection of 7000 works relating to psychiatry is now in Cambridge University Library. [Sir Rickman Godlee, President of the Royal College of Surgeons and pioneer in the field of brain surgery.] Autograph Letter Signed ('R. G. Godlee') to 'Mr Rowe', regarding a boy in a splint and a woman with cystitis. On letterhead of 19 Wimpole Street, W. [London]; 6 February 1899. 3pp, 16mo. Bifolium. In good condition, lightly aged, with thin strip of paper from mount adhering to the blank reverse of the second leaf. After acknowledging Rowe's note he continues: 'I should like the boy to get up and walk. He was supposed to be kept longer on the splint than usual, because there was so much adduction before.' The rest of the letter concerns 'a case of cystitis – a woman – who wants methodical washing out with A G N O Z.' He ends by asking whether it could be 'undertaken at the Infirmary'. [John Johnstone, physician and biographer of Samuel Parr.] Autograph Letter Signed ('J Johnstone'), concurring with 'Mr Pott' (i.e. the surgeon Percivall Pott) on the treatment of the recipient's 'complaint'. 2pp, 4to. Bifolium. In good condition, lightly aged, with thin strip of paper from mount adhering to reverse of second leaf, which is endorsed 'Docr. Johnstone | 6 Sep. 1786'. The recipient is not named. Twenty-eight lines of text, beginning: 'Dr Sir | I got home tuesday night and sent my son over to Mr Pott, to let him know your wishes. He answered he was engaged every day to dinner, and could not fix any particular time to be at Malvern. [Samuel Solly, eminent surgeon.] Autograph Letter Signed ('Samuel Solly'), apologising that he will be absent from 'the first Meeting of the Society'. For information on Solly, see his entry in the Oxford DNB. 2pp, 12mo. Bifolium. In fair condition, lightly aged, with slight damaged to second leaf caused by opening of wafer. Adhering to the second leaf is a thin strip of paper from the mount. The recipient is not identified. He is sorry that he will not be able 'to be present at the first Meeting of the Society', as he made an engagement before he 'remembered it'. He will 'endeavour to have something for the second night'. On letterhead of the Athenaeum, Pall Mall, S.W. [ London ] 25 February 1904. 3pp., 12mo. Bifolium. In good condition, lightly aged and worn. He offers him a choice of engravings, explaining his constraints; 'Aussi vous savez entre amis et artists un traitement secondaire sera indigne'. There is also Haden had strong connections with France; according to his entry in the Oxford DNB, he completed 'his professional studies in the medical schools of the Sorbonne, Paris, and Grenoble, where he acted as prosecteur in 1839, and, later, lecturer on surgical anatomy at the military hospital'. [ Sir William Job Collins, ophthalmic surgeon and Liberal politician. ] Autograph Letter Signed ('W J Collins') to 'Sir Henry', i.e. Sir Henry Trueman Wood, Secretary, Royal Society of Arts, explaining why he has no lecture ready for the Society. On letterhead of Meads End, Eastbourne. 8 October 1915. 1p., 12mo. 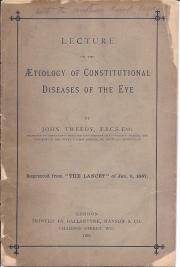 In good condition, with the Society's oval date stamp. He thanks him for the 'kindly renewed invitation to lecture at the R.S.A. As you surmise, I am too much engaged at present to put together anything worthy of so august a body.' He is 'collecting material & perhaps at that indefinite date - "after the war" - I may be able to put it into shape'. He concludes: 'We miss you at the Chadwick'. Reprinted from The Practitioner, August, 1947, vol.159, pp.83-86. Printed by F.J. Parsons Limited. 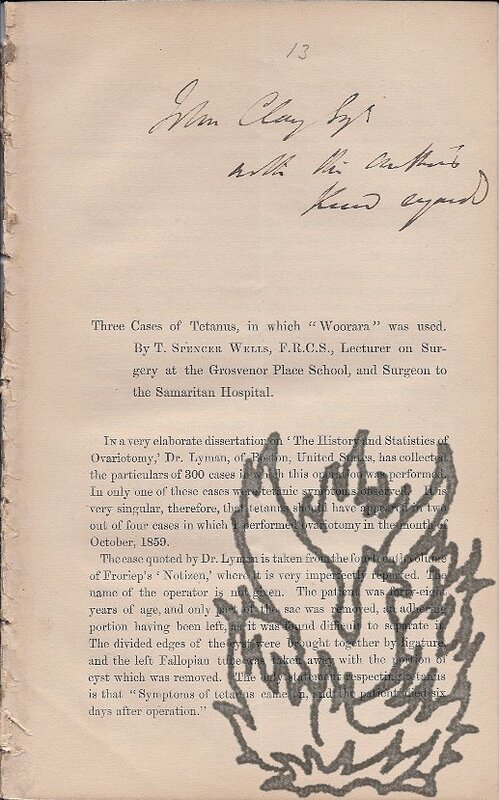 [ With presentation inscription from the author's widow. ] Recollections of my Early and Professional Life: By the late John Mann, M.R.C.S., L.S.A. 'Printed for Private Circulation.' London: William Rider and Son, 14, Bartholomwe Close, E.C. 1887. Xviii + 384pp., 8vo. In blue cloth gilt. Presentation inscription on half-title: 'Dr. Yelf | with Mrs. Mann's best wishes | June 27th. 1887'. Embossed ownership stamp on front free endpaper of address Gurney Cottage, Selsey, Sussex. Internally sound and tight, on lightly-aged paper; in worn binding with damage at head of spine. Now scarce. On letterhead of the British Museum (Natural History), Cromwell Road, London. 13 April 1896. 2pp., 12mo. In fair condition, on aged and lightly-creased paper, with traces of glue from mount at head of second page. Annotated at head in a contemporary hand. If mention of his name 'can in any way help you for the Welsh University or for any other post, by all means use it'. Regarding the 'next years cataloguing', plans are only in consideration, 'with the preparation of the estimates at end of the summer'. He explains that in the previous year these were 'framed by Dr. Smith', and that her application 'came just too late'. [ Sir William Fergusson, surgeon. ] Autograph Letter Signed ('Wm. Fergusson') to 'My dear Jane' [ 'Miss Bell | Bromley' ] (his wife's sister? ), giving news from Spittlehaugh. On his letterhead, 16 George Street, Hanover Square, W. [ London ]. 11 November 1874. [ Sir Victor Horsley, pioneer of neurosurgery and social reformer. ] Autograph Signature ('Victor Horsley') on part of letter addressed to Dr J. Davidson. [War Office publication.] Memorandum on the Preliminary Treatment of Maxillo-Facial Wounds, 1941. 4pp., 12mo. Bifolium. In fair condition, on lightly aged and creased paper. Headings: Respiratory Obstruction; Haemorrhage; Bandaging; Preliminary Operative Treatment; Injuries to Hard Tissues [Without loss of tissue; With loss of tissue]; Injuries to Soft Tissues (Skin, Muscle, Mucous Membrane) [Without loss of tissue; With loss of tissue; Drainage; Feeding; Mouth washing; Dressings; Disposal of cases]. 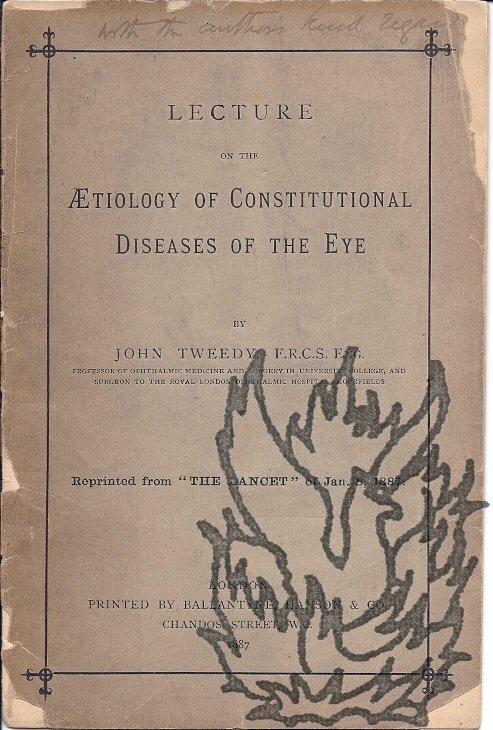 Scarce: no copy in the Wellcome Library or on COPAC, and only one copy on OCLC WorldCat. From a small archive of material belonging to Daphne Kayton of the Royal Army Medical Corps. [Sir Henry Thompson, surgeon.] Autograph signature. On 4.5 x 9.5 cm rectangle of paper, cut from letter. In fair condition, lightly aged, and laid down on part of leaf from album. Reads: 'Yours vy trly | Henry Thompson'. [Sir William Fergusson, Scottish surgeon.] Autograph Letter Signed ('Wm. Fergusson') [to F. A. Bulley], discussing the death of one of his patients from erysipilas, the effect of the news on other patients, the prevalence of the infection in London. 16 George Street, Hanover Square [London]. 27 December 1849. 4pp., 16mo. Bifolium. On aged and worn paper, with small spike-hole on one leaf. 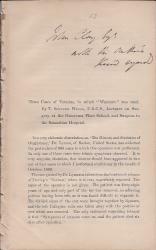 The letter begins: 'I am sorry to say that the poor man from whom I removed the large tumour has died of Erysipilas - It is a great pity - but one of those results over which we have little or no control - Perhaps the inflammation was a kind of continuance of that which he had on him when the operation was done'. He points out that 'at the present time the Hospital [i.e. King's College Hospital] is remarkably free from Erysipilas - a thing which few of us in London can boast much about in general'. 4pp., 12mo. Bifolium. On aged and worn paper with small spike-hole to one leaf. The letter begins: 'A hare and a pheasant delivered here the other day with F.A.B. Reading upon the parchment card - the initials, I immediately concluded of my old friend Mr. Bulley and the first information that he still lives after a certain bloody deed performed upon him many months ago. [Sir Francis Seymour Haden, etcher and surgeon.] Autograph Letter Signed ('F. Seymour Haden') to 'B. Gibbs', explaining his reasons for declining an invitation, and a 'lantern man' at 'Gipsy [sic] Hall'. On letterhead of Woodcote Manor, Alresford, Hampshire. 4pp., 12mo. Bifolium. On aged paper, with a patch of damp staining across both leaves. He should be happy to accept the 'kind invitation', 'if it were not that I believe I am to be the Guest of your Honorary Secretary Dr. Rice Oxley on this occasion'. He hopes that 'Gipsy Hall will be the proper to come to in either case'. He requires 'certain particulars', and will be writing to Oxley regarding 'the ability of the lantern man to obtain fine definition - linear definition I mean'. Autograph Letter Signed ('Chrisr. Heath') from Christopher Heath to 'Flower' [the Zoologist Sir William Henry Flower], regarding the qualifications required by 'a young man entering your department'. On letterhead of 36 Cavendish Square, W. [London]. 6 July 1895. John Tweedy, FRCS, Hunterian orator. London: Printed by Ballantyne, Hanson & Co., 1887. [Pamphlet/Offprint[?]] Three Cases of Tetanus, in which "Woorara" was used. Pp.-16, 8vo, disbound, numbered "13" in pencil, fold mark, spine showing wear, mainly good condition, inscribed "John Clay Esq | with the Author's | Kind regards". Typed Letter Signed ('Heneage Ogilvie') to Noon. 5 February 1952; on letterhead with the addresses of his London residence and consulting room. 4to, 1 p. Seventeen lines of text, clear and complete. Fair, on aged paper, with small area lacking in top left-hand corner. Concerning Hedley Atkins, who, '[a]s a Guy's man', Ogilvie is keen to have replace him on the Council of the Royal College of Surgeons, from which he is retiring after sixteen years. The condition with which Ogilvie is related, Ogilvie's Syndrome, was first reported by him in 1948. The collection is in good condition. Three of the communications bear the stamp of the Royal Society of Arts, of which the recipient Wood was the Secretary. May 4 [no year], with the letterhead 13 Harley Street. Surgeon (1836-1901). "My dear Lanyon, / The young woman who has been working for me for some time past comes here when I want her to work, very well knowing my writing &c. I should not like to change without Cause but if an opportunity occur would be glad to assist your friend. I am sorry I missed seeing you, but I hope I shall be fortunate when you call again." 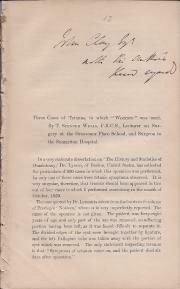 Signed "W. MacCormac". With four pieces of gummed paper from mounting still adhering.